Ok, ok, before I say a word about this recipe, I should tell you that the original recipe is NOT called Blueberry Blondies. 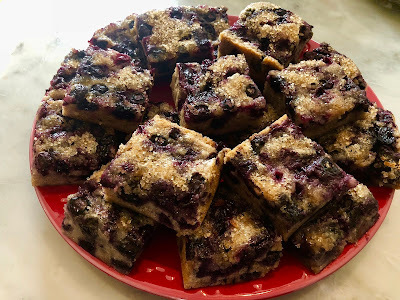 It was given to me by my friend, Gina, who found it on a blog called Averie Cooks, and it's really called Crustless Blueberry Pie. But here's the thing... As delicious as it is, in my humble opinion, it's not a pie! I mean, the only thing that made it a pie was the fact that it was originally baked in a pie dish. But even the blog called it "somewhere between cake and a blondie." And, since I was making it in squares, I decided to just name them blondies and call it a day. Oh, and since one pie plate's worth of batter wouldn't be enough for a 9x13 pan, I simply doubled the recipe and added a little sprinkling of coarse sugar over the top for a little crunch. So there you have it. Full disclosure! Actually, at first I wasn't going to share the recipe, considering that I had just repurposed it a little, and I thought maybe Averie would be a little offended. But then I decided to ponder what it would be like if someone had reworked one of MY recipes, and I thought "Well GOOD!" That's what cooking is supposed to be! That's how new recipes are born! You see what someone else has done, you tweak it here and there, you keep what you like, and change what you don't like, and then PRESTO we have something new! Sometimes it turns out to be completely different, and other times it turns out to be a blondie instead of a pie. The important thing is that YOU made it homemade for your family and friends, and everyone loved it. And that's a pretty awesome thing, I must say. So, Averie, if you're reading, please feel free to browse any of my recipes and repurpose them as much as you like! I would love to see what changes you make! Preheat oven to 350F. Spray a 9x13 pan with baking spray or line with parchment paper; set aside. To a large bowl, add white sugar, flour, cinnamon, salt, and whisk to combine; set aside. To a medium bowl, add the slightly cooled melted butter, eggs, extracts, and whisk to combine. Pour the wet mixture over the dry and stir to combine; don’t overmix. Add 4 cups blueberries and gently stir to combine; batter is very thick. Turn mixture out into prepared baking dish, smoothing the top lightly with a spatula. Evenly sprinkle remaining 1/2 cup blueberries over the top. Evenly sprinkle the turbinado sugar over the top. Bake for about 35-40 minutes or until edges are set and a toothpick inserted in the center comes out clean or with a few moist crumbs but no batter. Cool completely or chill before cutting into squares. The almond extract is quite a strong flavor. It definitely comes through. If you're not a fan, just leave it out! I listed the recipe with the amounts I used for the 9x13 pan, but if you'd prefer to bake it in a 9" pie dish, just cut everything in half! For a variation, try any other kinds berries or a combination there of!